The administration of criminal law in Zimbabwe has been taking a downward trend over the years with prisoners on remand experiencing lengthy pre-trial periods. This has caused overcrowding in prisons and detriment to the sus-pects whose presumption of innocence is compromised by the prolonged incarceration without their guilt being established. My quest for answers as to why the problem seems to be getting worse rather than better has prompted this research. This study enquires into the causes for the delays in obtaining a speedy trial for prisoners in custodial remand in Zimbabwe. This paper, enquires into the causes of the delays from the perspectives of various stakeholders and to analyse the role of the state organ responsible for the administration of justice; the judiciary, in realising the right to a speedy trial. I will also look at the role of the related institutions such as the Zimbabwe Republic Police (ZRP), the Zimbabwe Prison Services (ZPS), the lawyers in private practice as well as the significance of the judicial precedents on the right to a speedy trial that have been established through case law. 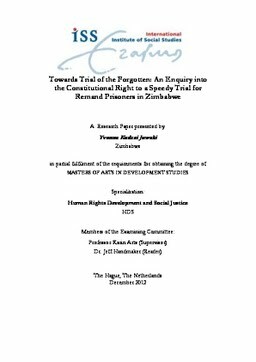 The essential elements of the Human Rights Based Approach (HRBA), such as accountability, participation and the interdependence of rights will be formulated into a methodology, identifying the gaps in the current practices of the judiciary and its related institutions as well as revealing the importance of adopting a HRBA to the claiming and realizing of the right to a speedy trial in Zimbabwe. In the end, some policy advice will be given, which can be adopted by the judicial policy makers in devising better strategies for the achievement of criminal justice.